Living in a muslim country I am enjoying Eid to the fullest. My school has closed for a full 10 days. Yeahhh. To celebrate Eid we had a few friends over for home, we had Lamb biriyani, the recipe which I will share with you today, mutton chops, beef fried, tuna cutlets, chicken kabab and raita. Quite a spread for a lazy goose like me if I may say so myself. The food was appreciated so here I am sharing the recipe with you. Truth to be said the biriyani is not an original recipe. It has been taken and modified from vahrevah.com. The sweet chef Sanjay Thumma, is just adorable, and his recipes fool proof. The masala for this biriyani is all mine. Another change I did was adding a potli of spices (a bouquet garni if you will) instead of adding it to the biriyani directly. I chopped 6 onions and deep fried it till golden brown. It is important as these fried onions impart colour to the biriyani. Take a muslin cloth add 1 cinamon stick, 2 green cardamoms, 2 star anise, 2 black cardamoms, 4-5 red chillies, 4 cloves, 2 bay leaves and a few pepper corns tie this up as a small bundle or potli as it is called in hindi. First boil the water ,add oil, salt and cook rice half cooked. Next marinate mutton with green chilly, salt, black cumin, chilly powder, chopped coriander and mint leaves, coriander powder, cumin powder, 1 cup fried onion, pepper powder, 1 tsp meat tenderizer, ginger garlic paste, lemon juice, curd and a bit of oil. Keep aside for a minimum of one hour. Take soaked basmati rice, add to boiling water which has salt, 2-3 bay leaves and 1 stick cinnamon. Cook for 5 minutes and remove half the rice to a colander. After one minute strain the rest of the rice in another colander. Take dough made with atta or maida and line it in the top of your biriyani pan and then close it with a tight fighting lid. This ensures the steam will not escape. Cook it on high flame for 5 minutes On a simmer cook it for 25 minutes and for another 10 minutes cook it on medium flame. Open the pan to the most divine smelling biriyani. 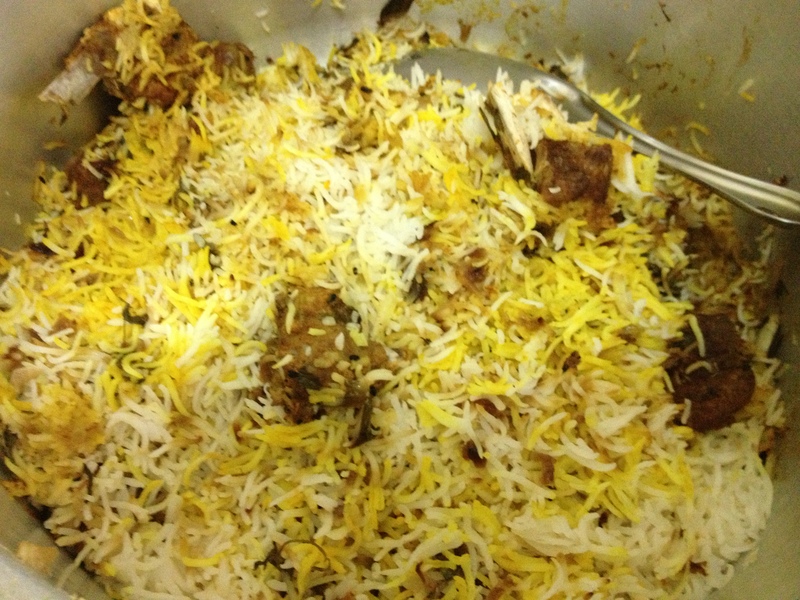 If the biriyani is looking a bit wet, have no fear just switch off the flame and leave it open for 5 -10 minutes. It will turn dry, fluffy and absolutely delectable. The biriyani rice will be perfectly cooked and the mutton will fall off the bone the minute you touch it. 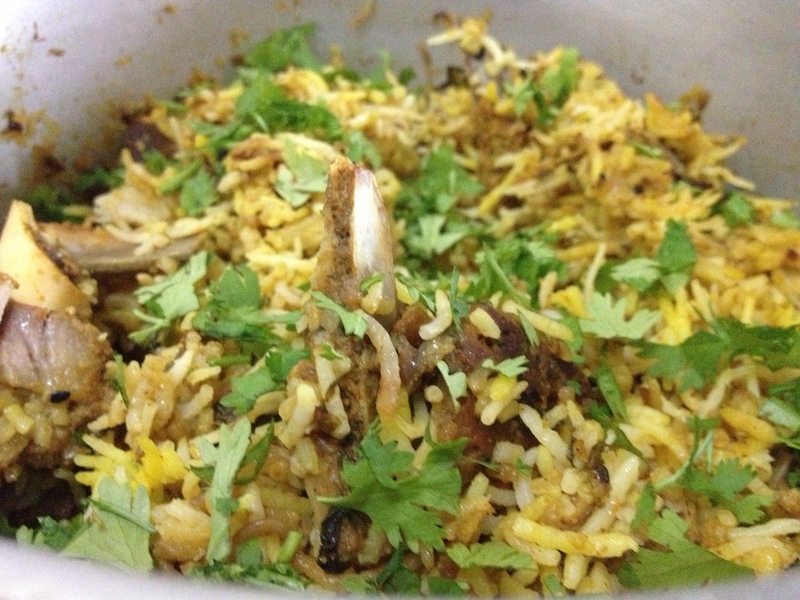 I am no biriyani expert, so if I can make near perfect biriyani so can you. Note: I repeat this is no original recipe but modified from vahrevah page.